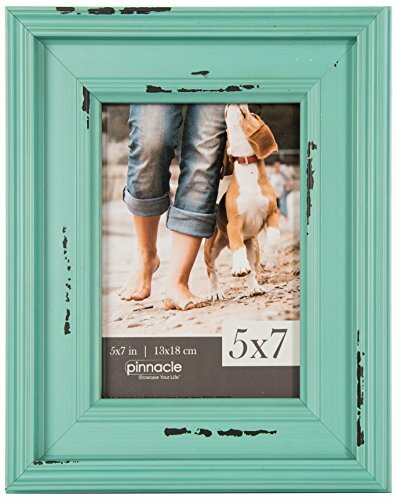 Gallery Solutions 5x7 Distressed Teal Tabletop Picture Frame by Gallery Solutions at Home Decor Outlet Store. MPN: 16FW1237. Hurry! Limited time offer. Offer valid only while supplies last. Display your most cherished photos with this 5''x7'' distressed teal frame. This frame features wood in a distressed tea and holds an 5''x7'' print. Display your most cherished photos with this 5"x7" distressed teal frame. This frame features wood in a distressed tea and holds an 5"x7" print. Display Vertically or Horizontally for a versatile and elegant home to your favorite snapshots. If you have any questions about this product by Gallery Solutions, contact us by completing and submitting the form below. If you are looking for a specif part number, please include it with your message.